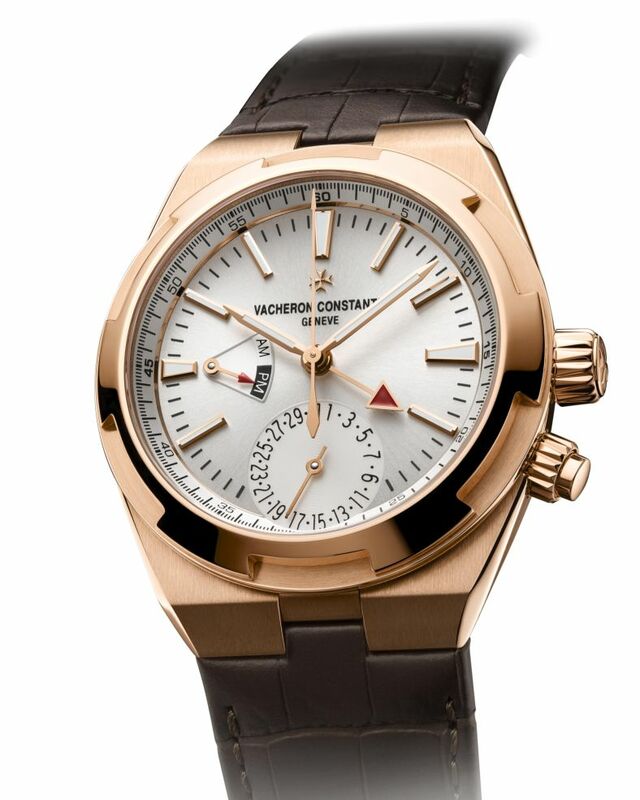 The case, in 18kt rose gold, or in stainless steel, measures 41mm x 12.8mm. Soft iron casing ring ensuring anti-magnetic protection. Double sapphire crystals and it is water resistant to 150 meters. 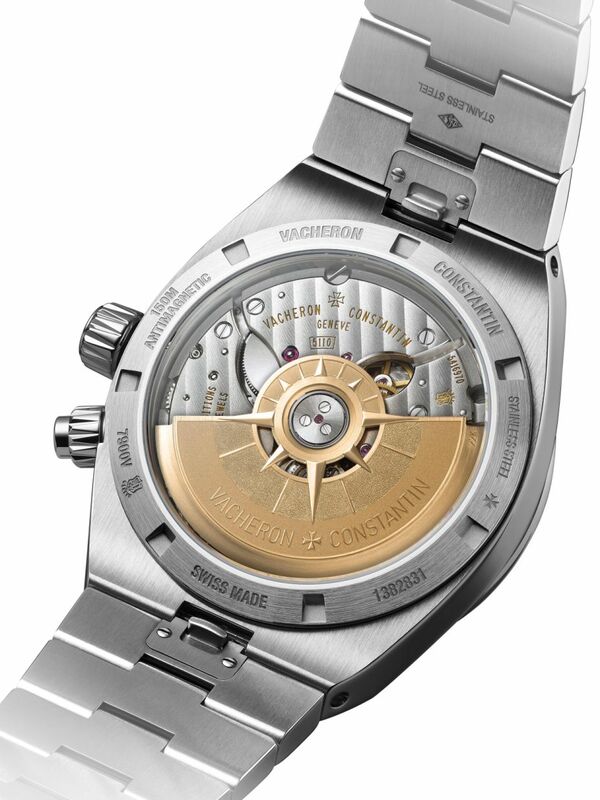 Movement is the Swiss automatic Vacheron in-house caliber 5110 DT with 37 jewels, 28,800 vph and a power reserve of 60 hours. 22kt gold rotor adorned with a Wind Rose. 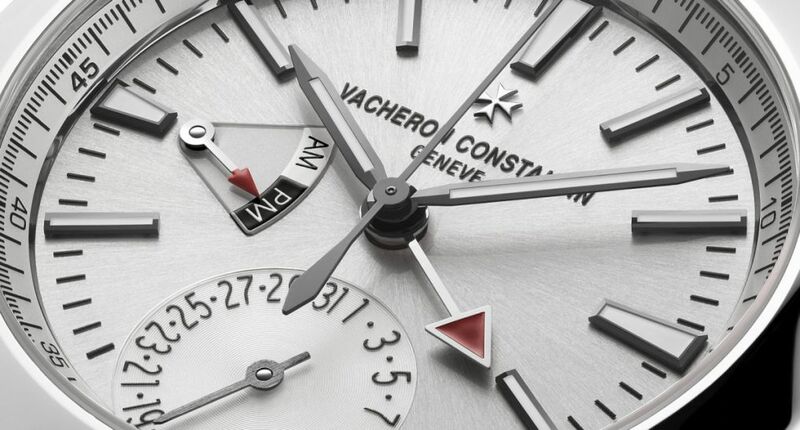 Hallmark of Geneva certified timepiece. Functions are: hours and minutes, central seconds. Second timezone, set by the crown. Day/night (AM/PM) indication at 9 o'clock, synchronised with home time. Date at 6 o'clock, synchronised with local time, set by pusher. 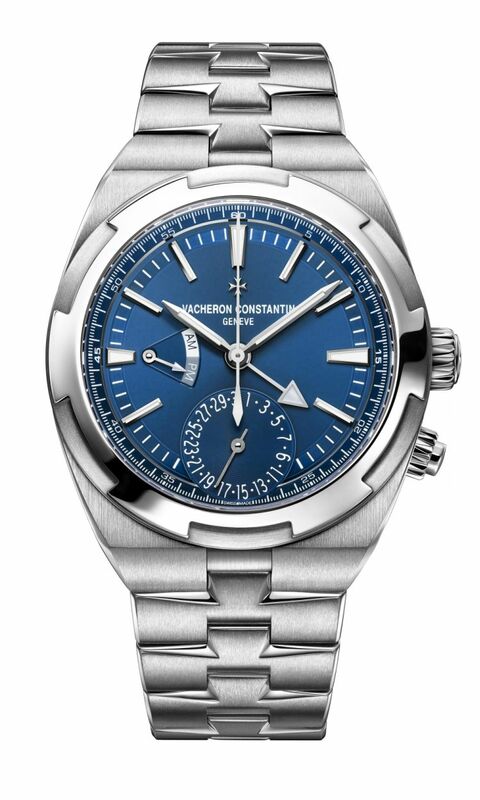 It has a translucent blue/silver-toned lacquered, sunburst satin-finished base dial with velvet-finished flange. 18kt gold hour-markers and hours & minutes hands highlighted with white luminescent material. The hours hand indicates the local timezone corresponding to the user's current location, while the hand tipped with a triangular arrow shows the time in a reference timezone, generally known as "home time". 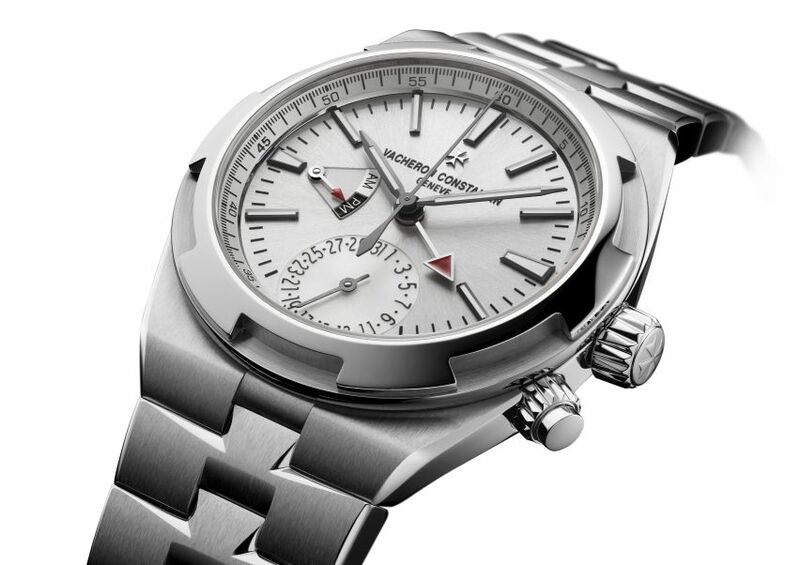 A 12-hour display, adjustable via the crown in both directions (position 1: local time, independent jumping adjustment; position 2: home time, dragging adjustment of both timezones and minutes), along with a day/night indication set to home time, and a pointer-type date display, adjusted and secured via a screw-lock pusher at 4 o'clock and synchronised with local time. It comes on a steel bracelet and is delivered with a second strap in blue/black Mississippiensis alligator leather featuring a black nubuck lining with a micro-perforated effect, hand-stitched, large square scales, and with a with a third strap in blue/black rubber with a steel folding clasp. The gold case model has a brown Mississippiensis alligator leather strap featuring a black nubuck lining with a micro-perforated effect, handstitched, large square scales, and is delivered with a second strap in brown rubber with a gold deployant. 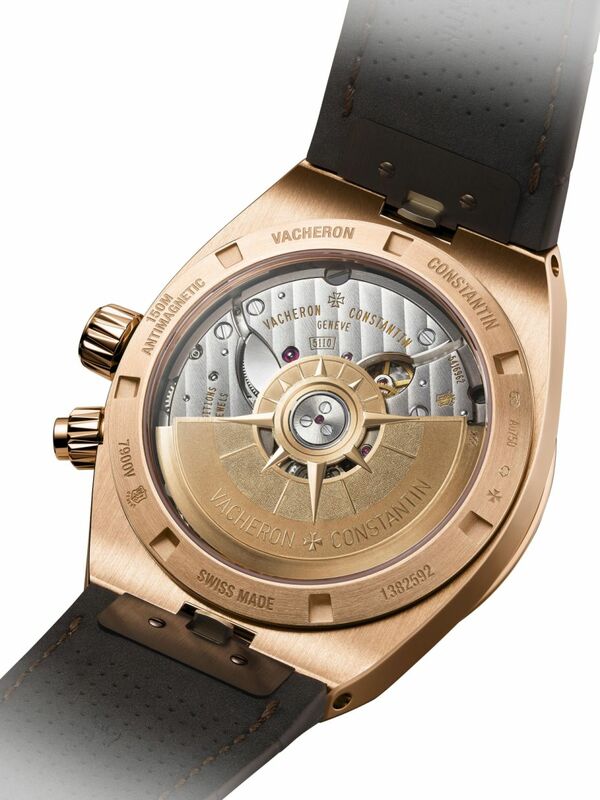 Next Topic: Is Vacheron Constantin missing the boat?